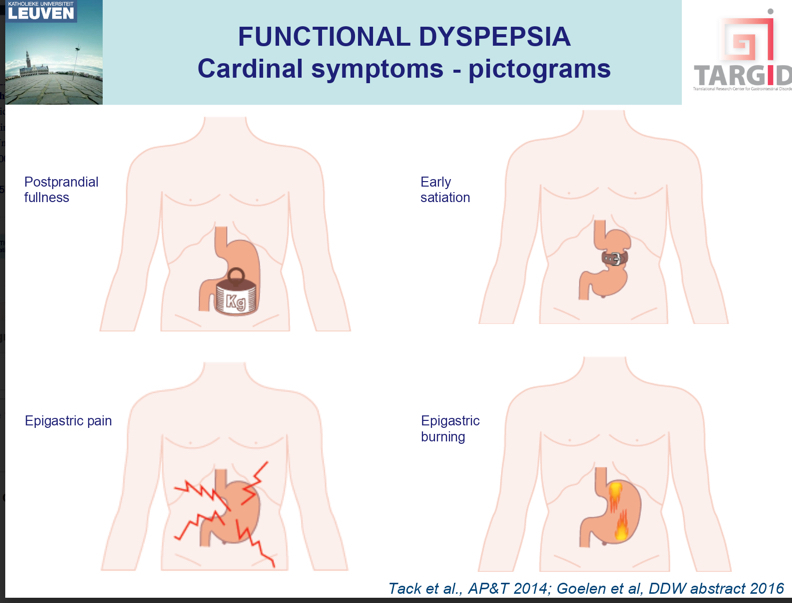 Dr. Drossman answers common questions on functional dyspepsia along with special guest, Professor Jan Tack, MD, who is incoming President of the Rome Foundation. Dr. 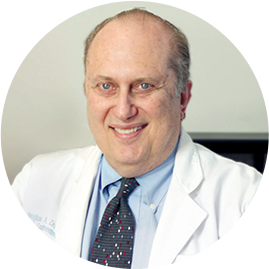 Tack is currently a Head of Clinic in the Department of Gastroenterology, a Professor in Internal Medicine and head of the Department of Clinical and Experimental medicine at the University of Leuven, and a principal researcher in TARGID (the Translational Research Center for Gastrointestinal Disorders) at the University of Leuven in Belgium. 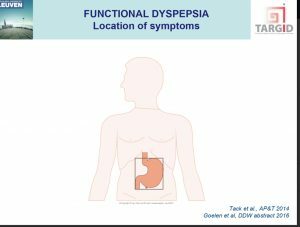 Functional dyspepsia is a condition characterized by symptoms that originate from the stomach region, with normal endoscopy. It can be considered the equivalent to irritable bowel syndrome in the upper part of the gastrointestinal tract. 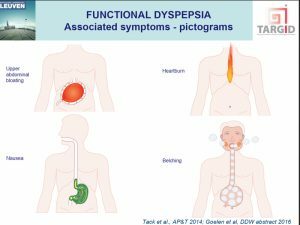 Functional dyspepsia patients have one or more of four typical symptoms: early satiation (inability to finish a normal sized meal), excessive fullness after a meal or pain or burning in the stomach region; gastroscopy is normal. Many patients also experience bloating, nausea and belching. Functional dyspepsia is highly prevalent, affecting up to 10% of the adult population. 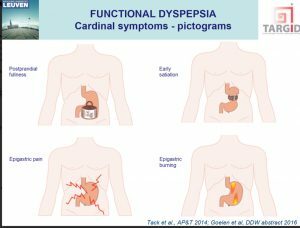 Symptoms seem to originate from disordered motility (contractions) of the stomach or from increased sensitivity of the stomach to a variety of stimuli. Treatment uses different approaches, such as acid suppressive drugs, drugs that modify gastric motor function (prokinetics) or neuromodulators that decrease sensitivity of the stomach. The following pictograms illustrate the nature of these symptoms to help patients understand and visualize what is happening in their bodies with functional dyspepsia.